Here’s the second no-brainer cookie of the day. 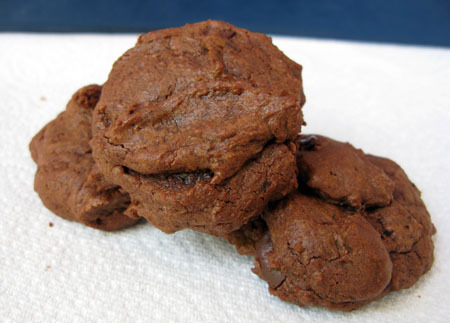 It’s a small batch version of an old favorite called Mocha Truffle Cookies – one of the easiest recipes in the world. Okay, maybe not that, but still easy and very good. Melt butter and chocolate together in a microwave-safe bowl (heat on high and stir every 30 seconds). Add instant coffee and beat with a spoon. Beat in both sugars, then beat in the egg and vanilla (again with spoon, no mixer required). Add the baking powder and salt and mix with the spoon – make sure there are no clumps of baking powder. Add the cocoa powder and stir until it’s mixed in, then stir in the flour and the chips. Drop by tablespoons onto the cookie sheet and bake on center rack for about 10 minutes – don’t overbake. Overbaking these cookies ruins them. When you take them out of the oven they should be kind of shiny and appear slightly underbaked. Let them cool and set. Makes about 16 cookies (or so). Hi Kate, thanks for the review! You’re probably right about using good chocolate. Oh my goodness! These cookies are out of this world. I made them with one bowl and a saucepan, because I didn’t have a mixing bowl that would fit in the microwave. I also mixed the salt, baking powder, and flour in the measuring cup instead of adding them in separately. They were so quick to throw together and really delicious. Even the batch that were cooked through because I forgot about them! Just make sure you use good chocolate. I think that that is where you truly risk ruining these cookies. I came across your blog one night when I was trowling around for an easy dessert recipe, and I found this mocha truffle one. It’s delicious and I wanted to thank you for posting it. Thanks for the cocoa powder add-in tip. I’m surprised you didn’t like these since you like mocha. Were yours fudgy? Did you try your cookie on the same day you made them? I’m asking because the first time I made this recipe my cookies were dry. I’d baked them for 10 minutes, but I found out later that my oven was running hot. Is there a chance your oven runs hot? If so, you could try baking them again at 325 F for 10 minutes. Also, these definitely taste better on day 1. But if they were fudgy and not overbaked, I guess they just weren’t for you. I’ll bet you could modify them a bit to make them more to your liking. The cinnamon is a good idea. But definitely watch the bake time and be careful measuring the flour. These really aren’t very good if they are over-baked (not that you did). My roommates really enjoyed these cookies, but they weren’t my favorite, and I love all things mocha. Someone suggested cinnamon, I think that would have been nice in place of the mocha. The directions did not mention adding the cocoa powder. I’ve been wanting to taste lots of different chocolate chips cookies side by side, but all of your double chocolate recipes make think they would be fun to taste side by side as well. Wow, Anna, another amazing cookie! These look delightfully fudgy and delicious. I want to go make them right now. You’re totally talking my language with these mocha truffle cookies. Katrina, maybe you could add cinnamon or mint instead of coffee. Anna, I think you like chocolate! I am thrilled to see this recipe…it looks so good. I printed it off and hope to get it made this weekend. I am sooooo far behind in making your recipes….I need more ovens/arms/bowls/mixers, etc. ;-) Thanks! Catherine, both cookies were really good. Louise, I like the idea of mixing dry ingredients on waxed paper but for some reason I always worried that I wouldn’t be able to blend them thoroughly. I guess I could. Lots of recipes say to to it, I just never got into doing it that way . Still, anything to save a bowl! VG, that’s good. I think a lot of recipes call for too many bowls. Katrina, the recipe uses instant coffee crystals and the cookies have a very pronounced flavor. I think the cookies would still taste good without it, though. Hi Amy! I hope you are enjoying this hot weather. Thanks for trying the cookies. I didn’t taste the batter, but if you like the batter you’ll love the cookies. Hi Pearl, I just saw your post about the Newman’s Own basket. Hope you are having fun with that! I like the Ginger O’s too. oh what a neat-sounding cookie! I am a compulsive batter licker and I can report that the batter is delicious. I’ll hold off on a eating a baked cookie and get back to you on that. But if you say they’re exceptional, and the batter is as good as it is, I know I won’t be disappointed. Thanks for a good afternoon diversion, Anna! I love all your double chocolate cookies, just don’t care for or use/buy coffee, do you think these would still be good without it? Love the one bowl. Unless I’m making filled or frosted cookies, I generally have only one bowl as I measure all the dry ingredients onto wax paper. I’m big on one-bowl cookie recipes, and these just look fantastic.